The time period between the Precambrian and Mesozoic periods that lasted for nearly 340 million years is the Paleozoic era. This era is divided into several periods like the Cambrian, Ordovician, Silurian, Devonian, Carboniferous and Permian. The Cambrian period was the first part of this era which started approximately 590 million years ago when the continents formed one large super continent called the Gondwana that includes all the continents like Africa, Antarctica, South America, Western Australia along with some parts of India, Mexico, Florida, southern Europe and China. Theses masses of the continent were situated in the southern hemisphere that stretched all most all over the South Pole and towards the North Pole the seas separate them. Initially the climate was pretty cool to moderate which later warmed up with the onset of the global warming which the scientific studies of the red sandstones and saline deposits reveal. 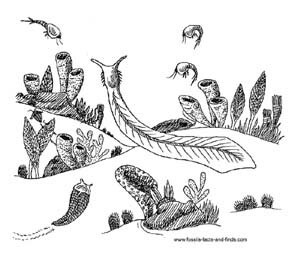 The development of the flora and fauna started extensively during the Cambrian period. The sea started to be the birth ground of the organisms like fungi, trilobites and crayfish like creatures that had a hard chitin amour along with prehistoric mussels. The algae and seaweed but terrestrial creatures mainly survived the flora world and plants did not show up at that time. The Ordovician period followed the Cambrian period that existed from 505 and 439 million years ago. The geological situation did not change much from the Cambrian era except for the fact that the continents started to shift towards the coast and the cost became more flooded. The era witnessed an ice age, which is evident from the moraines deposited by the glaciers. This period saw the evolvement of invertebrate creatures in the sea near the warm climatic regions. The deposition of the dark slates shows that existence of the multicolor graptolites which is an extinct form of flagella form with a chitin skeleton. A numerous types of calcera evolved in the shallow seas during this time. Even the existence of the first fish was also eminent during this period, however they did not have fins or jaws or looked like the modern day fish. Though no trace of plants or trees were found but the green and the blue algae was flourishing from the seawater to the fresh water. The plants did not seem to have come into being before the Silurian period. The third phase of the Paleozoic era was the Silurian period that encompasses a period between 438 and 408 million years ago. The geographically two continents were found totally interlocked, the northern Laurasia and the southern part called the Gondwana, alternatively both parts were submerged underwater. The North Pole was somewhere near the northern Pacific Ocean and the South Pole somewhere near southwestern Africa. The equator passed over the southeastern Europe over the northern Australia and Greenland to the center of America. During this time the climate was warm and humid that turned a little dry at the end of the era. The most common marine animals that existed during this period were the invertebrates like the trilobite, graptolites and simple corals. While the fauna consisted of the algae that stalked themselves at the bottom of the seabed, they also have tentacles around their bodies. The corals built great cliffs but lay extinct nearly 230 million years ago. Marine scorpions grew into gigantic forms during this time. The first jawless fish that had a cartilaginous skeleton appeared in the sea during this time, two of these species, which is the eel, like fresh water lamprey and slimy worm like blennies survive even today. During the end of this period we can find the existence of the primeval ferns and club mosses on the land. The fourth period of the era was the Devonian period that existence between 490 and 360 million years ago. During this time the continents were constantly on the move where the North Pole turned to be warmer while the South Pole witnesses severe ice belt. Numerous animal species started to evolve during this period, the first fish with jaw existed during this time. The shield headed fish was the first vertebrate creature that was present during this period; the original skeleton was formed not by the bones but by the cartilaginous matter. During this period there was thorny and lobe finned fished that had rigid skeletons and thick fins and was able to survive on the land. They were able to exist in dried ponds and water bodies and later evolved into land creatures. The Maine life included creatures like the corals, ammonites, sanails, crayfish and echiderms while the scorpion, arachnids, terrain reptiles and wingless insects lived on land. The next period was the Carboniferous period which is the fifth and last phase of the Paleozoic era that began 360million years ago and ended 286million years ago. This period is also known as the anthracite because the largest coal deposited on the earth was said to have been formed during this time due to the favorable climatic and geological factors that existed on the earth during that time. The climate that existed during that time was a bit hot and humid which is similar to the climate prevailing in the rainforests. This period saw the evolvement of the mountains and plates due to the havoc tectonic movements and the land was majorly covered with dense forest that often remained submerged under the water over some period of time. The forest contained club mosses that grew nearly 30 meters, fern and horsetails that are very much similar to the swampy forests. The first vertebrate evolved during this time and evidences of amphibians were not too rare at this time. At the end of the carboniferous period the animals started developing lungs for breathings. These reptiles with lungs did not require to return to water for laying eggs. They were the predecessors of todays tortoises and turtles.